In September 1957 Arkansas Democratic Governor Orval E. Faubus became the national symbol of racial segregation when he used Arkansas National Guardsmen to block the enrollment of nine black students who had been ordered by a federal judge to desegregate Little Rock’s Central High School. His action created a national crisis with President Dwight D. Eisenhower finally ordering federal troops to Little Rock to ensure the judge’s order was obeyed, to protect the black students, and maintain order for the remainder of the school year. 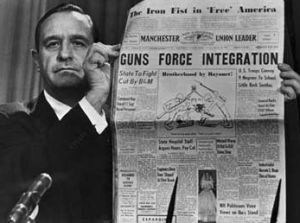 In the speech below Faubus defends his actions and calls for continued resistance to racial integration and what he calls an all-powerful, intrusive federal government. Those who would integrate our schools at any price are still among us. They have seized upon the present situation to promote and foment concern and discontent, because of the temporary closing of the schools. They have spread wild rumors and attempted to organize demonstrations. These are the same people and the same forces who have all along been opposed to the majority will of the people of Little Rock and Arkansas…. I am fully aware of the deep concern of the parents for the continued proper education of their children, and I am fully aware of the inconvenience to the students in the interruption of the proper educational processes. To them, both parents and students, I express my sympathy and understanding. To the students who are concerned, I say that in the years to follow, when you have come to realize the importance of maintaining our form of government, and the importance of preserving the great freedoms and privileges which we have known, you will be happy and proud to remember that you suffered inconvenience and personal sacrifice, and thereby made a worthwhile contribution to the maintenance of our dual system of government…. In this dual system of government, with its checks and balances, lies the strength of the United States of America…. To you people in this struggle who seek to preserve our form of government, I am proud of my role as a leader in the fight. I did not seek this role. It was thrust upon me in the course of events. I did not, nor do I now, shrink from my responsibilities in what is perhaps the greatest struggle for constitutional government during this century. To you who oppose the great majority of Arkansas people in this fight, I urge you to think—lest in your consuming desire to gain your ends, among them the destruction of Orval Faubus, you destroy also the very principles of government that enable you and all others to live as a free people, and to rear your children under the high standards of living and freedom which prevail in this state and nation. It was with a heavy heart that I found it necessary to sign the bills of the Extraordinary Session of the General Assembly and to close the High Schools in the City of Little Rock. I took this action only after the last hope of relief from an intolerable situation had been exhausted. The Supreme Court shut its eyes to all the facts, and in essence said—integration at any price, even if it means the destruction of our school system, our educational processes, and the risk of disorder and violence that could result in the loss of life—perhaps yours. This price, you as a people are unwilling to pay. This price I could not see you pay without first offering to you a legal plan whereby a catastrophe can be avoided, and still provide the opportunity of an education of our children. This plan I now explain to you in detail. This plan is within the law. Even the Supreme Court, in the so-called school integration cases, has not ruled to the contrary. This plan is based upon our own State Constitution, written and adopted in 1874, and Arkansas Statutes enacted in 1875. First. The federal government has no authority to require any state to operate public schools. Second. The federal government has no authority to tell a state government for what purposes it may levy taxes, or how the tax money may be expended. Third. In all the cases involving the public schools and integration, the federal courts have said only that an agency of the state cannot maintain segregated schools. This ruling does not apply in any way to private schools. Private schools are not affected by these decisions, even though the schools receive aid from state and federal sources. In 1875, the General Assembly enacted two laws which give us a legal way to maintain a private system of education, at a time when a part of our public educational system cannot be maintained in a suitable and efficient manner. Our own educational people have testified that a suitable educational system at Little Rock cannot be maintained on an integrated basis. Why, then, should we even attempt to keep these schools open as public schools when, based upon this sworn testimony, they clearly do not meet our constitutional provisions for a suitable and efficient system of education? We have a perfect right to close these schools as public institutions, and once closed and found to be not needed for public purposes, the school board has the right and the authority under a law that has been on our statute books for 83 years, to lease these buildings and facilities to a bona fide private agency…. [convert the high schools to private segregated schools]. Now, it is crystal-clear that if the voters of the Little Rock School District vote against integration on September 27th, these facilities will become surplus and not needed for public school purposes…. In this connection … I received [a letter] from the School Board…. I accept this letter as having been written in good faith by immediately offering to a private group these unoccupied school buildings after the election. I say immediately after the election, because I have no doubt that the people of this school district will never voluntarily integrate their schools. I am confident that the vote on September 27th will be against integration. I say a private group, because I understand that others may be formed. Once again I am compelled to point out to the people of this city, this state, this nation, and the world, if you please, that our objective has been to maintain the peace and good order of the community. As long as there is a legal way, as I have outlined, to maintain the peace and good order and a suitable educational system. I will not shirk from my duty and responsibility…. Under Act 5 of the Second Extraordinary Session of the 61st General Assembly, a student seeking an education in another school, either private or public, because of a situation such as exists here now, will have the benefit of all funds to be expended for his education. The funds follow him to the school of his choice anywhere within the state. The plan is sound and workable. It is all legal. To this the advocates of the so-called “law of the land” can have no objection…. There are many things in this [the] report [“Investigation of Public School Conditions” by the Committee on District of Columbia, House of Representatives, 84th Congress] which I cannot, in good taste, mention on this television program. Write to your Congressman and secure a copy of this report and read for yourself the revolting and shocking developments in the Washington, D.C., schools, following integration. Now, what will you be voting on at the Special Election, September 27th? It will not be just to open the school or keep it closed, although that is a part of it…. It will not be deciding the question of segregation versus limited integration. In the ultimate, there can be no such thing as limited integration, so far as the public schools of Little Rock are concerned. The choice you make on Saturday, September 27th, is whether to continue to fight for our constitutional rights, and the opportunity to find an acceptable solution to this problem, or you vote for the beginning of complete and total integration. And if the latter be your decision, it will come sooner than you think…. the races here, will be gone forever…. In conclusion, to you citizens of Little Rock, I must warn that you will be subjected to a terrific propaganda campaign from now until September 27th. This barrage of slanted, distorted, and even false versions, will emanate—yes, is already emanating, from the same sources as before—both inside and outside the city and the state. I know you, the people, will understand. This issue is now where all public issues belong—in your hands, the hands of the people. The decision is yours to make. Your decision will be my decision, as I am your public servant. Public sentiment is with you in this struggle to preserve our legal and time-honored rights. If you stand fast, we can win!